The first Presbyterian church in Ancaster was founded in 1826 by the Rev. George Sheed. Prior to this the Presbyterians of Ancaster shared a building with the Anglicans. Sheed came from Scotland and made his home at the Hermitage before dying suddenly in 1832. A frame structure on the site of today’s church building was still under construction at the time of his funeral. Sheed was succeed in 1834 by the Rev. Mark Young Stark, who served the churches in Ancaster and in Dundas. Both took the name St. Andrew’s from the patron saint of Scotland. In 1844 the Presbyterian Church of Canada was split by a dispute in Scotland. Rev. Stark chose to sever his connection to the Church of Scotland and formed Free Church congregations in both communities. While Knox Church, Stark’s new congregation in Dundas thrived, the Free Church in Ancaster struggled. In 1854 Rev. Stark was relieved of the Ancaster congregation, which then dissolved in the following year. The Church of Scotland congregation in Ancaster also struggled and ceased to have a settled minister after 1858. These challenges were due in part to the decline of the Village of Ancaster, which was first overtaken by Dundas and then Hamilton as the main commercial and industrial centre of the region. In 1855, the Rev. John Lees was called to the United Presbyterian churches in Alberton and Carluke. Upon his arrival he formed a new United congregation in Ancaster Village. In 1861 the Free and United Presbyterians merged to form the Canada Presbyterian Church. In 1872 the Canada Presbyterian congregation bought the St. Andrew’s building and property from the Church of Scotland. The two congregations merged before 1875 when all Canadian Presbyterians came together as the Presbyterian Church in Canada. Today’s St. Andrew’s is the coming together of three different churches founded by three visionary ministers: George Sheed, Mark Young Stark and John Lees. In 1876 St. Andrew’s was joined to Alberton Church and the two churches shared ministry together until 1994. The stone church building that stands on the site today was completed in 1875. The original wooden building was moved to make way for construction and burned down in 1879. The bell cast in 1835 for the old church was installed in the spire of the new building. Instrumental music was first heard in the new sanctuary in 1879 with the installation of an organ (prior to this, singing was led only by a strong singer called a Precentor). Ancaster remained a quiet rural village until the housing boom that followed World War II. 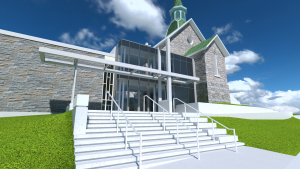 With the construction of new subdivisions and plans for what is now Highway 403, a decision was made to expand the church facilities to make room for growth. In 1961 a new addition was completed containing a gym, kitchen, offices and a parlour. 1990 saw the last major renovation of the church building when the sanctuary was completely redesigned. By 1994, continued growth in the surrounding community and within the church led St. Andrew’s to become a self-sustaining congregation with its own minister for this first time in its history. The late 1990’s and 2000’s also saw the development of a praise band and the introduction of more contemporary elements to the worship service.